Snow can leave salt stains on shoes and in some cases they are very difficult to remove from certain materials such as natural leather. 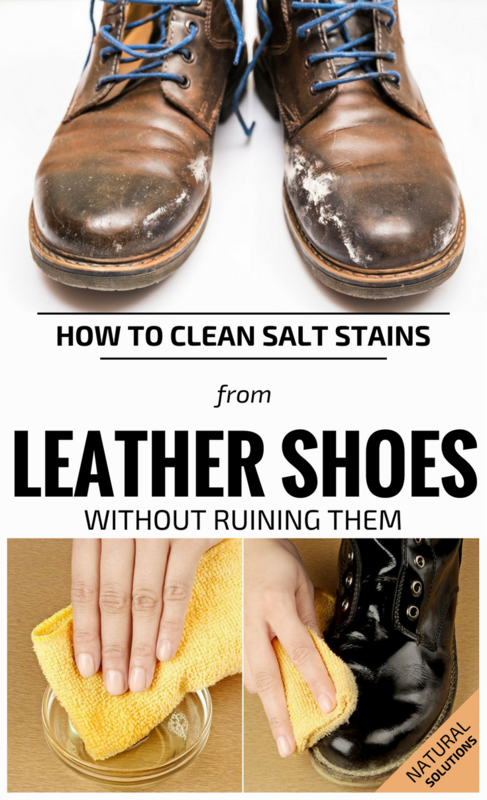 To clean these unsightly stains off your leather shoes, without ruining them, try the following natural remedies. Moisten the cloth in water and remove surface salt as much as you can. If stains are fresh, they will be easier to clean, so it’s indicated to clean your boots right after you took them off. Mix the vinegar and water in equal quantities then moisten the cloth in this solution, and wipe gently your boots until you’ll get rid of salt stains. If this mixture doesn’t remove the salt stains completely, try to use vinegar as such to wipe the boots. Vinegar can be very corrosive to the leather shoes, so it would be a good idea to use a shoe cream or a special solution for leather after using vinegar, not to ruin your boots. Another option to clean salt stains from your leather boots, is to cut an onion in half and to rub your boots with it. Wipe them with a cloth moisten in warm water and apply a leather shoe cream afterwards.